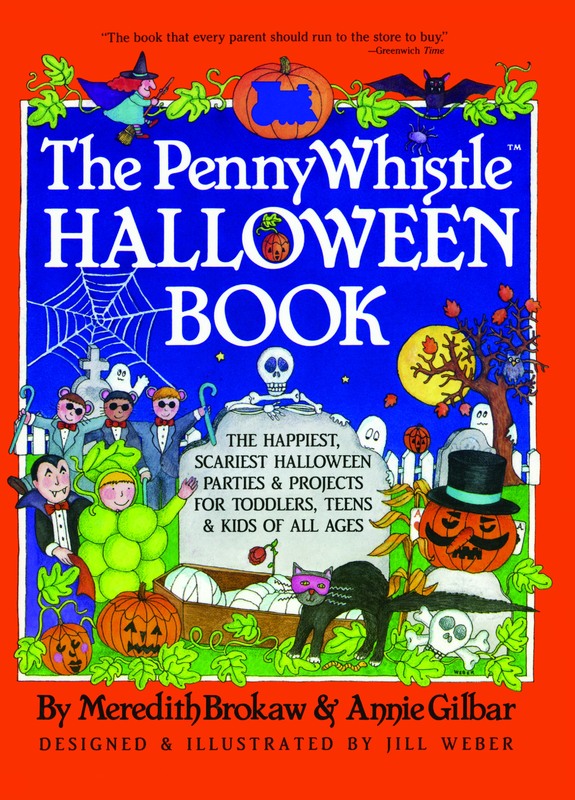 Turn your home into a happy haunting ground with The Penny Whistle Halloween Book. Myths and Mirths: If the Druids Could See Us Now! The night is somber, gloomy, and overcast. The atmosphere is still and ominous. The moon is partially hidden by threatening clouds. There are odd sounds. The first is a seemingly innocent meow of a black cat, silhouetted against that eerie moon. Then there is a groaning moan -- it must be a ghost. Next a swishing witch sweeps by on her broomstick. And now there is a piercing, menacing shriek -- the vampire is at work again. Millions of children and adults cannot wait for this type of encounter. Wake any child the morning after Halloween, and the first words out of his or her mouth are sure to be, "What should I be next Halloween?" At Halloween, happiness and fun are often measured by how gruesome, ghastly, ghostly, scary, and horrifying a celebration you create. This is the time when gravestones are memorized and epitaphs echoed, when skeletons are funny and headless, bloody corpses are relished, when coffins are amusing and macabre monsters entertaining. The more imaginative, outrageous, and bizarre we are, the better. For centuries Halloween has captured the hearts of children and adults. It was a different Halloween when the Celts occupied Europe, long before the birth of Christ. It was the time for all who lived good lives to feast, a kind of Thanksgiving. This All Hallow's Eve was also the night when ghosts and goblins walked the earth. People lit candles and masqueraded in frightening costumes made of animal skins to ward off the spirits of the dead, who returned to earth as wandering cats and witches and ghosts. The people in costumes began to visit homes, asking for treats -- those who gave them would be assured of having a good year; those who did not were warned to watch out for evil spirits. Thus this "Halloween," with its customs of offering thanksgiving for the harvest, wearing costumes to ward off evil spirits, and begging for food to ensure safe souls, soon spread. The Romans, after conquering England and France, introduced their own touches: they bobbed for apples and gave nuts to their neighbors. The Italians left bread and water, and lit lamps before going to bed to appease visiting ghosts. Other Europeans put out doughnuts and milk for the returning spirits, and still others placed empty chairs in a circle, one for each member of the family and one for an expected ghost. In the nineteenth century, Irish immigrants brought the holiday to the United States, where it has evolved to become, in the last two decades, a national celebration. Halloween has traditionally been a holiday for children. It was the children who dressed in imaginative costumes and paraded door to door, begging for treats. And it was the children who played mischievous tricks when they were not treated. Today, Halloween has become our nation's Mardi Gras -- a wonderful national family holiday. It is the perfect celebration for parents and children, enabling them to spend time together creating costumes, carving pumpkins, planning trick or treat activities, and participating in family parties. Halloween is the one time of the year when it is acceptable to act out many of our fantasies. On Halloween we can be scary or scared; we can look gruesome and ugly or ostentatiously beautiful. We can have fangs or smiles on our pumpkins and on our faces. We can be vampires or supermen or fairy princesses or belly dancers or bees or televisions -- we can be anything! For children, Halloween is an especially exciting time. It appeals to their imaginations, stimulating any inner urges to be something or someone else, to do things they would never think of doing on other days, to dress up as images they fantasize about or fear. At Halloween children can lose themselves in fun without having to worry about normal, proper, or appropriate behavior and dreams. They can be "grown up" by dressing up; they can go to parties and door to door at night; they can look silly or awful or glamorous, look any way they please; they can scare others and themselves; they can masquerade and fool those around them, calling attention to themselves. And, on Halloween, it's all right. For some children, Halloween can be intimidating. According to child psychologist Dr. Lee Salk, such fears are normal, and Halloween is a good time for children to deal with them. Halloween allows anxieties and misgivings to come out into the open, letting children manage what is at other times nightmarish. It is a time that helps them deal with any fears of death, darkness, ghosts, and monsters openly, without the risk of being laughed at. Since Halloween is actually a publicly endorsed chance to be outrageous, it allows the child to become the "monster" of his or her fears. It is important, at this time, to be extra sensitive to children's fears, however inexplicable or silly they may seem to adults. Dr. Salk explains, "Halloween today has a special significance because many children feel helpless in the face of violence on television, kidnappings, and other tragedies occurring in their world. So today the monsters under the bed that scare them are really the monsters inside their heads" And these monsters are different for every child. One child may be afraid of a ghost, but another may be afraid of clowns -- and even though clowns may seem harmless to an adult, to a child they can be frightening and this fear must be understood. If your child shows some fears, urge him or her to express those fears and decide on a costume that he or she will love and not be frightened of wearing. For such a child, celebrate in a way that emphasizes the magical qualities of Halloween -- the fantastic rather than the gruesome. Choose Cinderella or a magical harlequin rather than a tombstone or a witch. Remember that Halloween is just as much a holiday for fairy princesses as it is for ghouls. Some say it was the Celts who began the practice of trick or treating by offering to buy off evil people with treats before they turned on them with tricks. Others say it started with the Druids, Celtic priests who begged for favors in exchange for protection of souls, or with the Irish peasants, who begged for "soul cakes." It was the English who took it a step further -- they put on masks and costumes as they begged for treats, and if their treats were not forthcoming, they played tricks. * Have your child carry a flashlight, not only to help her see, but to help others see her. * Watch out for dark costumes. If your child is dressed in black, add a white face if it is appropriate. Walking in lit areas with a flashlight will help prevent accidents. * Trick or treat at homes your child knows. * If you can, join your child. Children unaccompanied by an adult should always go in groups. * Make sure your child wears a flame-resistant costume. Keep costumes short, or hold up long ones as he or she walks. Remind your child to keep an eye out at all times. He or she may find candles, forgotten tools, or broken or loose steps in other people's yards. * Watch out for other people's pets. A thoughtless neighbor may leave his dogs out to roam. Be sure to shield your child from pets you do not know. * The U.S. Consumer Product Safety Commission encourages parents to remind children not to dart between cars. Trick or treating is done at night when lighting in the streets can be poor. Drivers should be watching for trick or treaters but sometimes they do not. Try not to leave this to chance -- prepare your children by reminding them to stay on the sidewalks and to cross the streets with an adult. If your neighborhood does not have sidewalks, do not trick or treat. * The Consumer Product Safety Commission also warns children not to eat any candy before their parents check it out. It is unfortunate that this care must be taken, but it is a reality of life today. Always check for possible tampering with packages before letting children start on their treats. * If a sword, cane, or stick is a part of your child's costume, make sure it is not sharp or too long. A child may be easily hurt by these accessories if he stumbles or trips. * Try to dress the children in their own shoes. Wearing high heels or shoes that are too large can be dangerous and uncomfortable. * Have your treats prepared and by the door so you don't have to go looking for them. If you are handing out popcorn or cookies that you have made, have them prewrapped. * Create a unique way to give out the treats. Simply placing the treats inside a carved-out pumpkin or in a basket makes them seem extra special. * Clear your yard and walkways. Remove any obstacles (tools, ladders, skateboards, toys, stools) and repair any loose steps. * Position pumpkins with candles in an area where they can still be seen but will not be in a child's way. Consider placing flashlights rather than candles in pumpkins that are outdoors. * Replace lights or bulbs that are burnt out. A well-lit front yard and walkway is a safer one. * Author Bud Trillin has said, "...giving trick or treaters raisins or apples or granola or wheat germ or mung-bean crackers is finklike behavior." We tend to agree. This is not the best time to make a point about nutrition. Meredith Brokaw, former teacher, mother of three, and wife of TV anchorman Tom Brokaw, is the founder and owner of the Penny Whistle toys stores, dedicated since 1978 to providing original, creative playthings. She lives in New York. Greenwich Time The book that every parent should run to the store to buy. Carol Deegan Associated Press A unique witches' brew of ideas. Newark, New Jersey Star-Ledger Everything you and your children need to know about giving and enjoying the greatest and scariest Halloween parties ever....A complete and charmingly illustrated guide. Hagerstown, Maryland Herald The single best source of Halloween party inspiration.